Perimeter Venting System | GMS Drum Co.
GMS has taken the next step in getting the most out of a snare drum. The Perimeter venting system (PVS) has taken the concept of symmetrical resonant venting one step further. The concept of the PVS is quite simple. At the bottom bearing edge, between each lug, a .195” hole is drilled up and then is connected to another hole at 90 degrees. What this does is let the air column as far down as possible copletely resonating the bottom head, before escaping evenly through the holes around the perimeter of the drum. This drum will blow your mind. 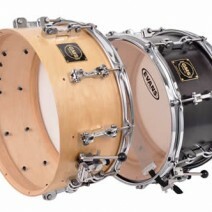 Extreme snare action with unparalelled sensitivity and response. The force of the stick pushing the air all the way down reacts like it’s being compressed a bit. Increased volum and focus for an absolutely killer back beat but sensitive enough for light playing. They come in three standard exterior finishes – Midnight, Natural and Walnut Burst and they can be custom ordered in any of GMS’ classic or custom finishes. 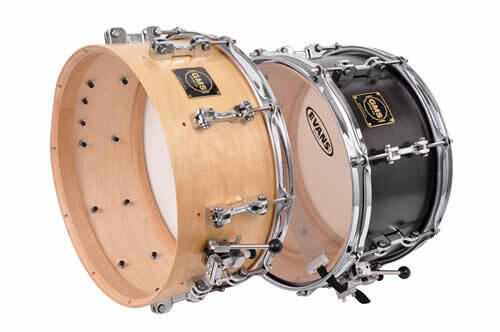 Revolution Snare drums can be ordered with brass, copper or nickel silver/steel interiors. They come in three standard exterior finishes – Midnight, Natural and Walnut Burst and they can be custom ordered in any of GMS’ classic or custom finishes.